It's been a long time since we've been to Camas, Washington, a town of about 20,000 situated about 20 miles east and across the Columbia River from Portland, Oregon. Named for the camas lily, an onion-like bulk prized by Native Americans, it's home to a lumber mill as well as several high-tech companies, and Roots Restaurant and Bar. Although we've never had the pleasure to dine at Roots, we were very attracted to chef-owner Brad Root's rendition of halibut when it was printed in the Oregonion newspaper several years ago. Chef Root's pleasant pairing of spring onions, fava beans, shiitake mushrooms presented on halibut resting on a bed of rice makes for a most unique flavor combination. 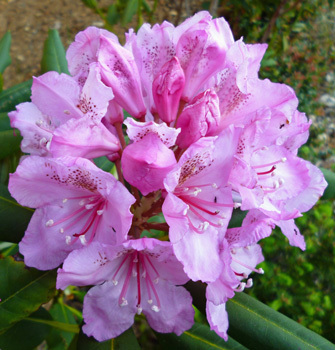 The forest is ablaze with color in spring. 2006 was a wonderful year for a lot of reasons, not the least of which was the discovery of Chef John Eisenhart's Ligurian Bread Salad. It's a wonderful dish that's plump with flavors and textures. For us, it's made most noteworthy by its use of wild mushrooms, whether they be the porcini mentioned in the list of ingredients or an alternative mushroom such as portobello or shiitake. 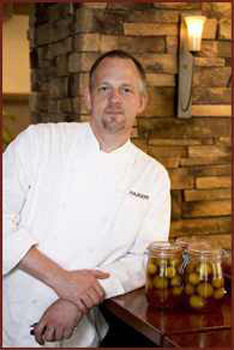 John Eisenhart is Executive Chef of Pazzo, a highly regarded Italian eatery in the heart of downtown Portland. Marked by an exhibition kitchen and wood-burning stone pizza, Pazzo serves up Northern Italian classics that feature Pacific Northwest ingredients. "Sophisticated yet warm and comfortable" is one way to describe Pazzo's atmosphere. Apart from the food and the wonderful aromas that result, people appreciate the congenial service and the PazzoBar with its signature cocktails and black and white cinema on the big screen. A visit to Pazzo is invariably memorable. 2006 was the year that the Oregonian newspaper printed Chef Eisenhart's Ligurian Bread Salad recipe. We love the dish not only for its generous use of wild mushrooms but also for its ability to tease and tantalize as we change the type of mushroom and the herbs that are incorporated into the salad. The recipe continues to be prominently featured on our list of fungal favorites. Chef Eisenhart agrees that it's one of his favorites, too! When the wind is roaring and howling around the house and rain is filling the gauge faster than it can be emptied, what to do with the kids? May we humbly suggest visiting the Internet - that is, if the electricity doesn't go off during the storm. We discovered Squidoo, thanks to a brief article by Maggie laDanza, editor of MushRumors, in the bi-monthly newsletter of The Oregon Mycological Society (OMS), and found the site to be a wonderful source of mushroom craft ideas, patterns and tutorials that are primarily aimed at young people. For the child in all of us, we especially liked Sher-Rockee, with fanciful drawings as "Buttons Plays Baseball", "Buttons at the Beach", "Rockee's Friend Portabella", and "Bella is Trick-or-Treating"...simply charming cartoons which are available for downloading and coloring by children of all ages. Young people and adults will both fall for HelloKids and its delightful "Fairies on a Mushroom" illustration that can be printed out and colored or that can be colored on-line. Be careful if you explore the on-line coloring option; it's tricky, and more than a little addictive! So we leave you with three suggestions that might work out well for mycophiles and their kids on a stormy spring day. If you have your own favorite mushroom diversions on the Internet, please let us know, and we'll be happy to add them to this post! The last mushrooms we saw in the non-Internet world were at the base of a eucalyptus in Pismo Beach's Monarch Butterfly grove. Growing your own mushrooms can be great fun! When we recently heard that The Thyme Garden was holding a mushroom cultivation class, we just couldn't resist telling you about it. We first visited The Thyme Garden a couple of years ago when we attended their "Midnight in the Garden of Good and Everything" event. Their catalogue describes it as "one of the most awesome evening events of the summer! The evening begins with a memorable experience of strolling through the gardens sipping a glass of Tyee Wine Cellars premium wine as darkness slowly creeps in and the herbs release their exotic nighttime fragrances. Followed by a delicious herbal feast and live music. After dinner and a round of sinful desserts we will take our traditional night walk through the forest...and...then the fun really begins." We can't adequately describe the amazing journey that follows dinner but we can advise you to be prepared for perhaps the most memorable night walk of your life. "Midnight in the Garden of Good and Everything" is an experience not to be missed; it offers a memory that will last a lifetime! 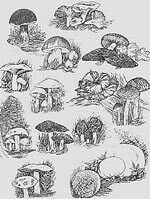 We just found a great new-to-us mushroom blog that we'd like to share with you: The Cornell Mushroom Blog. 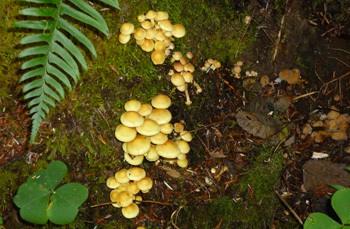 February 2012 - introducing George F. Atkinson whose "influential work in the late 1800s and early 1900s took mycology a big step forward." December 2011 - a tale of 11 different lichen species on the oak trees that line the north side of the road. September 2011 - a conk goes postal! 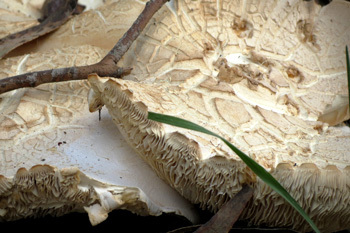 November 2010 - illuminating Panellus stipticus, a glow in the dark beauty. Even the most ordinary mushroom is extraordinary.